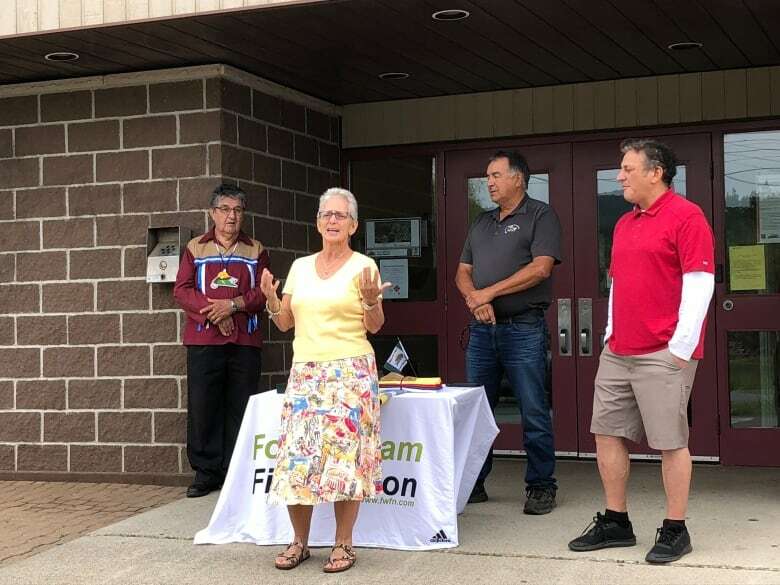 Fort William First Nation raised a pride flag to honour and recognize two-spirit people in the community. 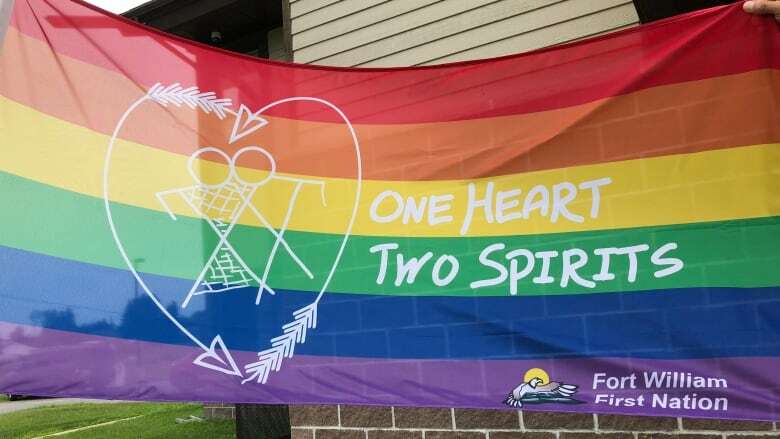 Fort William First Nation raised a special pride flag today in honour of two-spirit people in the community. The flag, which features a man and a woman in an heart of two arrows, is meant to celebrate the acceptance of two-spirit people. Chief Peter Collins of Fort William First Nation says it is important to acknowledge what two-spirit people have contributed to the community. "They get overlooked a lot of times," said Chief Collins. "We got to make sure we recognize them as people in our community." Lorraine Bannon, an elder at Fort William First Nation, designed the flag with the culture's symbolism and the two-spirit meaning in mind. "I put the arrows in a heart which represents native culture and I put the man and the woman sort of together because that's sort of an indication that whether you're a man whether your a woman you may feel the difference of what you physically are," explained Bannon. She said the one heart surrounding the man and woman signifies "one person who's two-spirited" and the pride stripes also signifies the importance of ribbons in native culture. She said she learned closely what two-spirit meant from her mother-in-law. "She would tell me about two-spirited people, how in the community, they were seen as honorary people. So that if there were a family of orphans, they had the honour of looking after them because they had that nurturing quality of them." Bannon said years ago, people utilized the differences of people, but that sentiment got lost over time when society began to look down upon people. "Today, it's coming more to light," she said. "We have several people in our community that are two-spirited and we've even had one suicide on our community," said Bannon. "It's a statement that society needs to be more understanding and I think this is a perfect thing to say: this is our community and we respect people of all differences." Raili Saarinen is a community member that helped spearhead this project. In the past Saarinen carried the pride flag through the grand entry of powwows. After years of lobbying to get the flag created, the new flag will now be carried through instead. Saarinen says the raising of the flag isn't just important for him, but more important for the next generation who struggle with their own acceptance. "It's not just for me. My time has passed. It's important for these kids. It was different for our time [and] we want our kids to know that it's okay for them to be themselves." Saarinen says the raising of the flag will save lives because it instigates a symbol of acceptance within the community. "Some of our young two-spirited people, they might have those feminine qualities and they get teased for that, they get bugged for that and they take their own lives," Saarinen said. "I don't want that to happen out here. We've already lost one and we don't want to lose anymore." "It's not who you love; it's how you love." Saarinen says this initiative is important because he wants to ensure that children in the community don't have to feel what he felt when he was younger. "That flag is going to be there 365 days to eternity and I'm very proud of that."